Scarves are always handy to have on hand, for those days when you just can’t put together more than the most basic outfit. Well you can step up your style game even more by tying those scarves in unique ways… so today we’re here to share 25 of our very favorite ways to tie a scarf. Keep reading to get inspired! If you have a larger scarf that you’d like to tie around your neck without the bulkiness, the bandana style is a great way to do it. Simply fold it into a triangle, and bring the two smaller ends around your neck. Find out all the details over at Cort In Session’s blog. If you have a giant blanket scarf, then you’ll love this genius tying technique. Drape it around your shoulders and then tie a belt around your waist. This style will provide some extra warmth for your arms too! Find out more over at Karamode’s website. 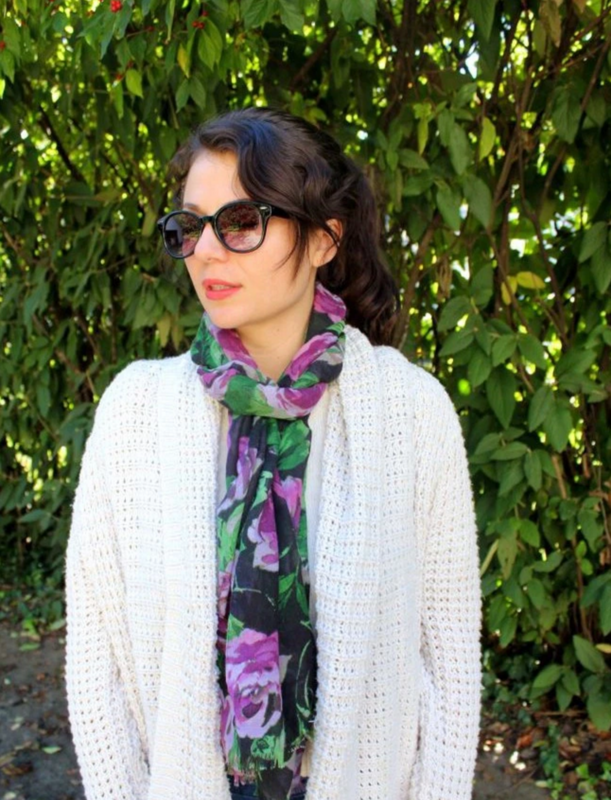 Here’s a clever style for a long skinny scarf that is thin and flowy. The key is to fold it in half first, and then drape that half around your neck and tuck the ends through in alternating ways. Head on over to One Good Thing By Jillee to check out all the info on this technique. 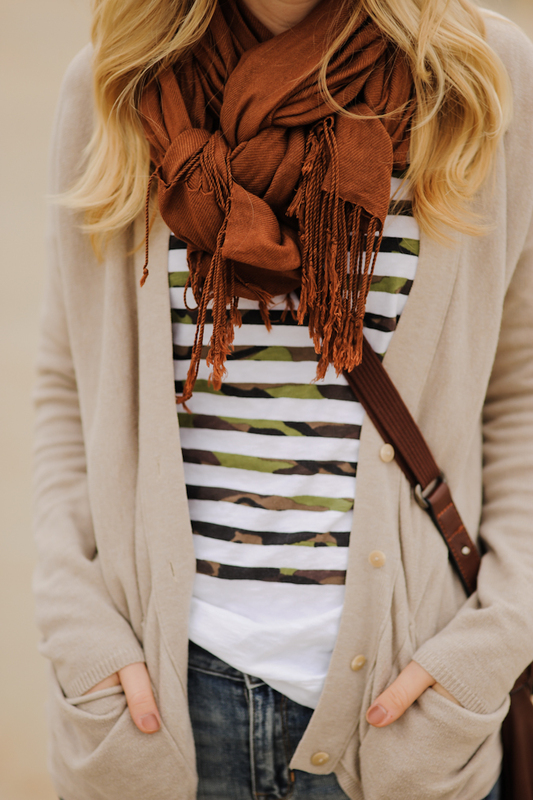 Here’s another cool way to incorporate a belt with your scarf. Start with a large blanket scarf and fold it in half so it forms a triangle. Then simply drape it around your neck and belt it. Make your way over to Life With Emily to find out more about this fun look. This one is shown with a blanket scarf, but it would work with any square scarf. 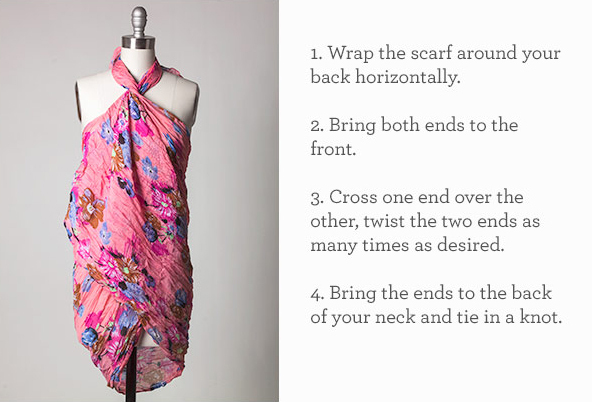 Begin by folding it in half into a triangle shape, and wrap it all the way around your neck. Then loosely tie the ends, and you’re finished! Check out two other great styles at Classy Sassy. For an extra feminine touch to your outfit, give this one a try. This style done with a large silk scarf, but a similar look could be achieved with a smaller one too. Fold it in into a triangle, grasp clumps from the two sides and wrap a hair tie around it! Found here. This scarf tying technique is a bit more complicated, but it sure will look cool once you master it! 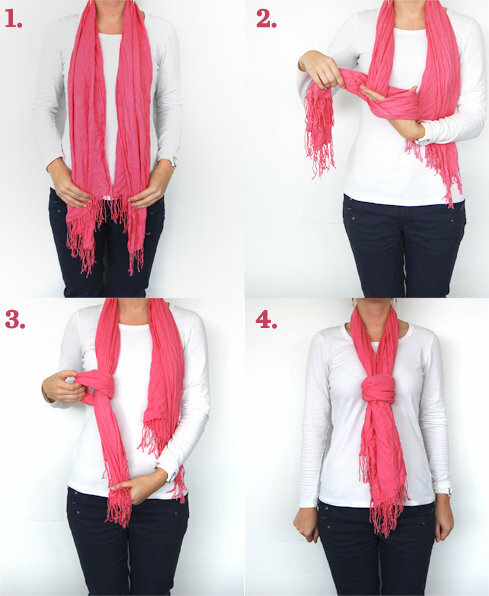 The key is to fold the scarf in half first, and then loop the ends through in a certain way. Find out exactly how to do it by checking out this video at Sidewalk Ready. This scarf has the look of a knot, which it is, but it has a bit more to it than just a plain old double knot. Here, you’ll start with a single knot on one side and then slip the other un-knotted side through it. 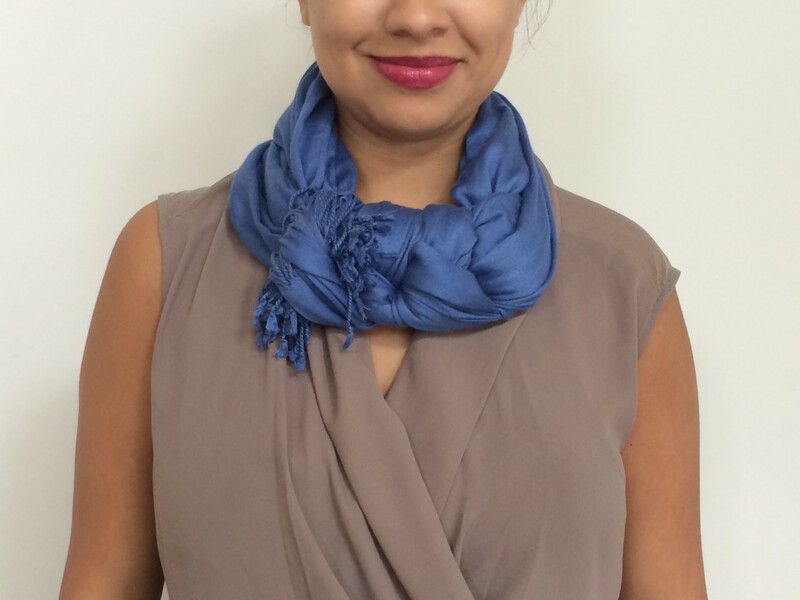 Head on over to Good Housekeeping to see three other ways to tie a scarf. This style looks like a giant bow… so cute! 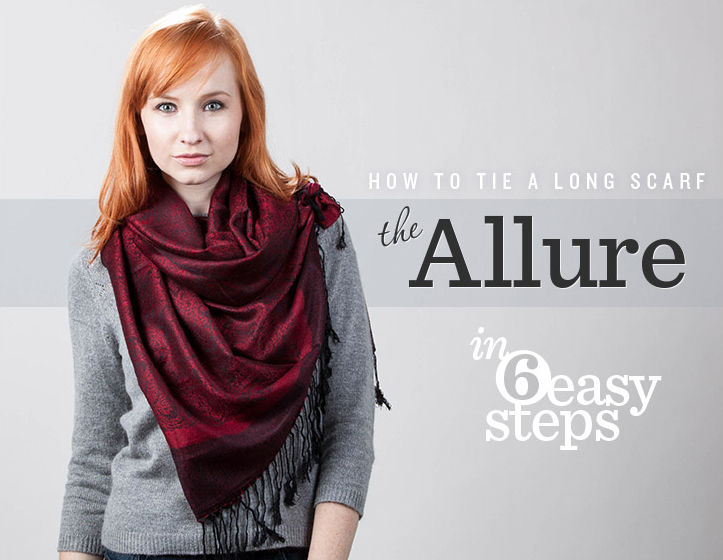 For this one, you can use any scarf that’s longer than it is wide. Begin by grasping one end and making it into a circle, then pulling the other end up and around. Check out the full photo tutorial at Yet Another Beauty Site. If you’re into the simple style associated with the uber stylish ladies of Paris, then you might want to give this idea a try. For this look, you’ll need a long skinny scarf which you will loop around your neck and then tie once. Found over on Blair Eadie’s Instagram account. You can even turn a scarf into a necklace of sorts, which is a great way to take advantage of your collection even when it’s warm out. This style is done using a pashmina. Make your way over to Julep to find out how to do this style, as well as a couple of others. This look is part bandana style, part knot. Start exactly the same way you would to do a bandana tie, but then tie the ends to create the knot shown above. Head on over to Style By Joules to check out the instructions for this one along with lots of others. 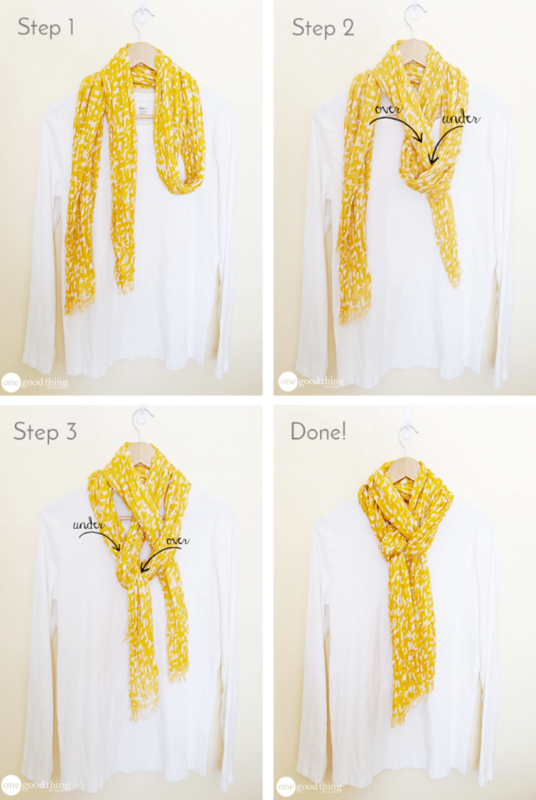 Here’s a clever one… this tutorial shows you how to turn a regular scarf into an infinity style, no sewing required! Simply tie the ends together, and then loop it twice around your neck. Head on over to the Vera Bradley blog to check out this and many others. This one has a bit of a twist, with the ends tied and displayed rather than hiding them away underneath. Fold it in half into a triangle and tie the ends, then loop over your head twice and show off those ends proudly! Head over to Her Campus to see more ideas. Here’s a fun one which will surely get you some compliments. Begin with a folded triangle, fold that in half, then loop that around your neck and poke the ends through the loops. Check out the full photo tutorial over at Style By Joules, along with lots of other ideas. This is just a small variation on any of the more traditional ways to tie a scarf, but this one looks unique because the section that wraps around the neck covers the knot so it looks nice and clean. Find out how to recreate this look over at Hello Glow. Here we have a scarf wrapped around the waist, creating a belted effect. This was done at the Marc Jacobs runway show, but could easily be recreated by any of us regular folk. 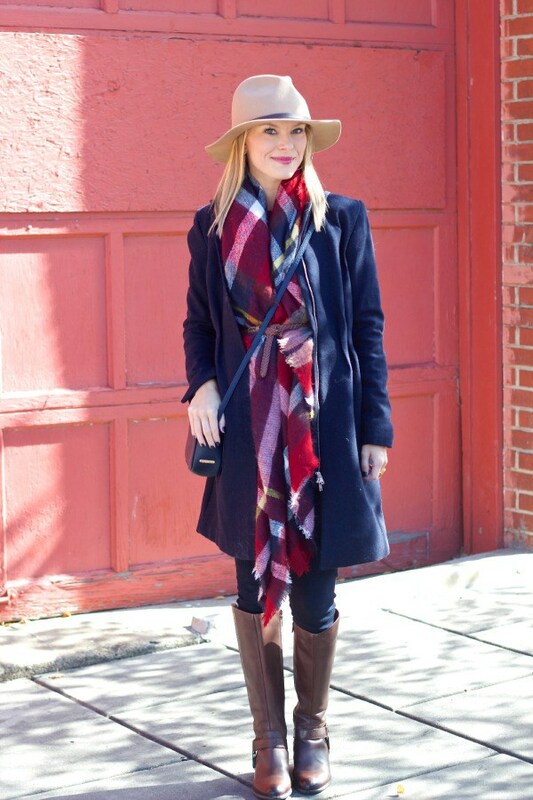 Just fold a large scarf into a triangle and tie it above your hip. Found here. Here’s another cool alternative to a traditional scarf tie. 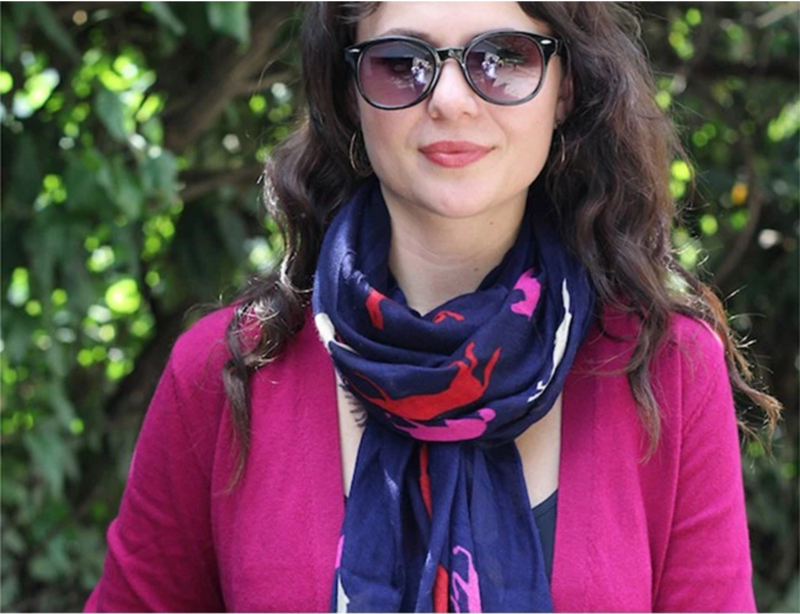 Starting with a pashmina or a similar long scarf, wrap it around your neck once and then tie the corners and toss it over your shoulder. Check out the full photo tutorial over at Her Campus. Believe it or not, you can even turn a pashmina into a super stylish little coverup for the beach! This is a skirt style, and all you have to do to recreate it is to wrap it around your waist and tie the two top corners together. 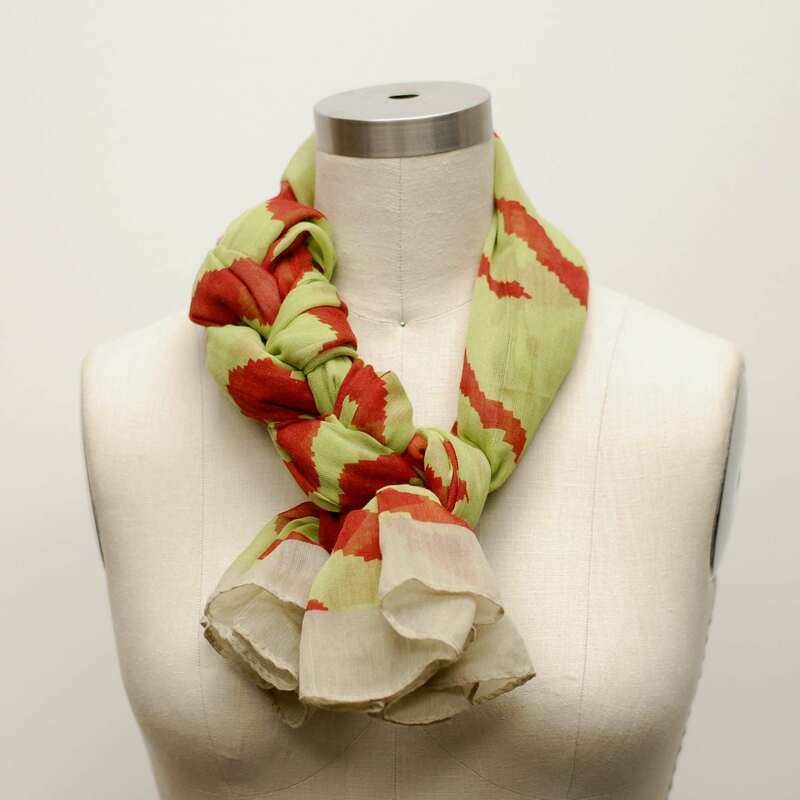 Check out lots of other ideas at Scarves.com. Here’s another cool way to tie a scarf, and it can be done with lots of different types of scarves. 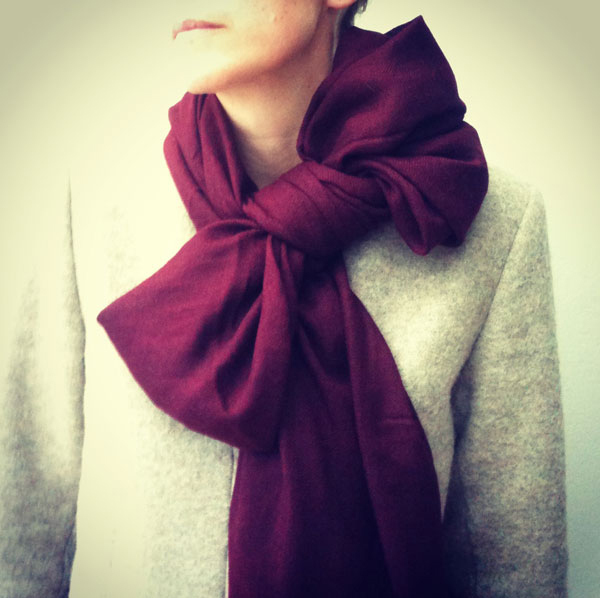 Simply drape a long scarf around your neck once, and pull the ends up and around the loop that’s around your neck. Check out the photo instructions at Hello Glow. If you’re looking for a full coverup for the beach, look no further! 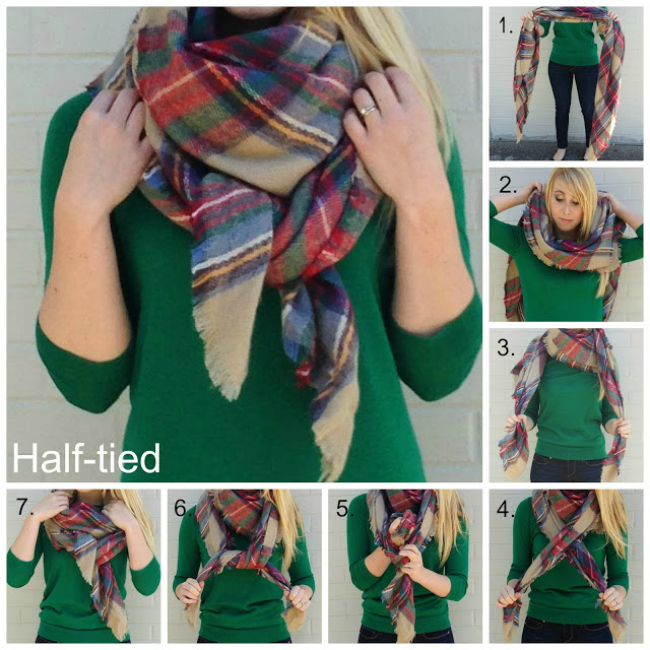 This might be one of my favorite ways to tie a scarf. 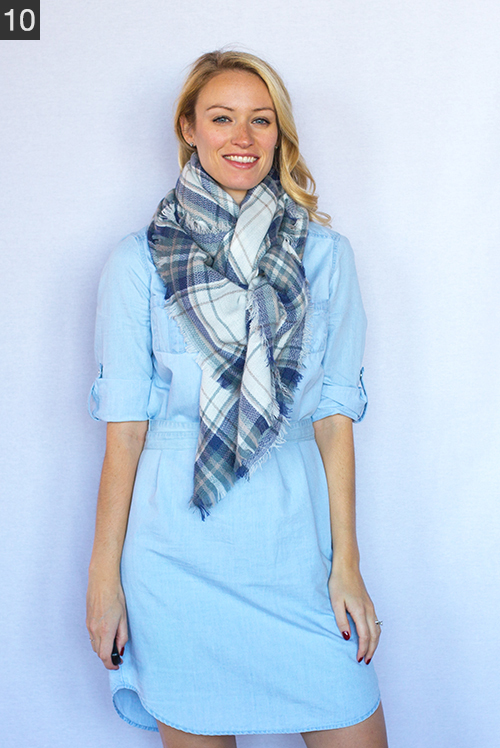 You’ll need a large one for this style… simply wrap it around your body and loop the ends around your neck. Check out the photo instructions here. 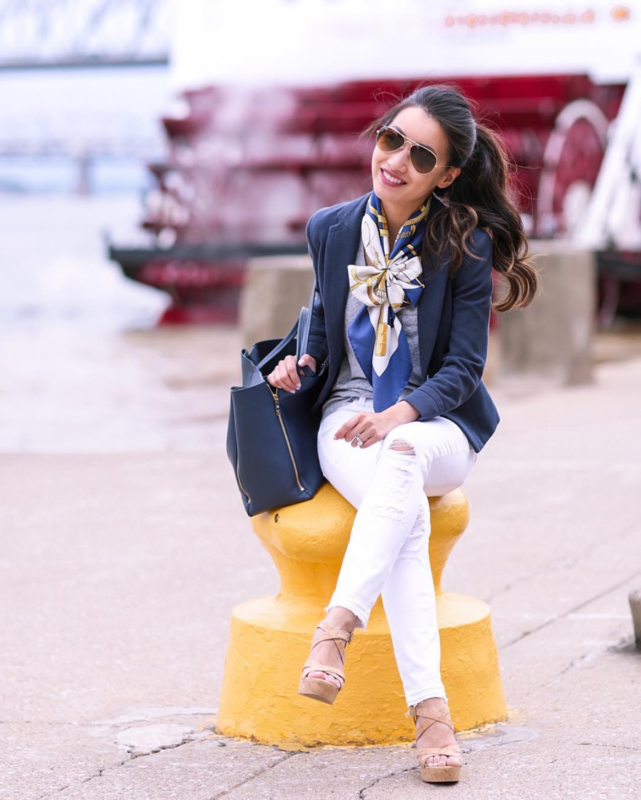 This is a pretty look for any long, skinny scarf… wrap it all the way around your neck once and then wrap the ties around and around that loop repeatedly on both sides. Make your way over to the Lady Violette blog to check out the full photo tutorial. This technique doesn’t involve much tying… instead, grab a vintage brooch and secure your scarf that way! 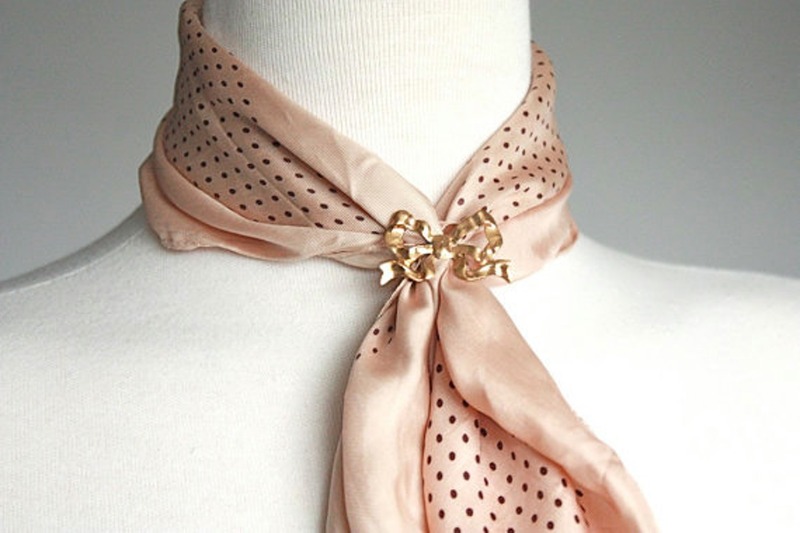 Just wrap a small silk scarf around your neck and pin the brooch up by your neck. 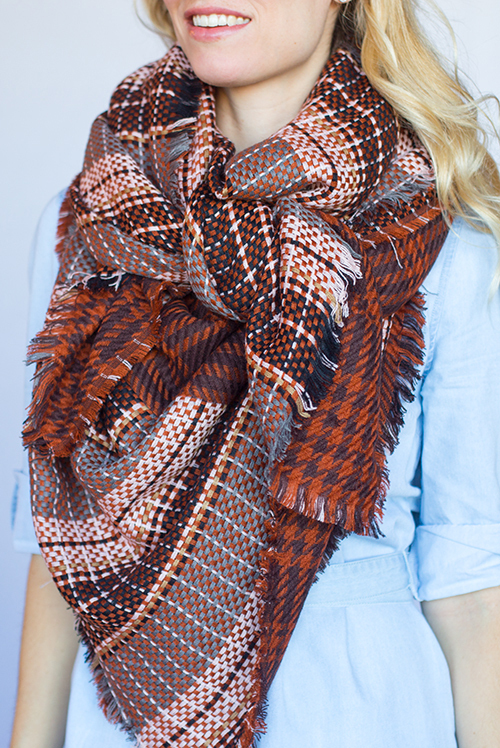 Head on over to Bustle to check out 20 other great scarf ideas. 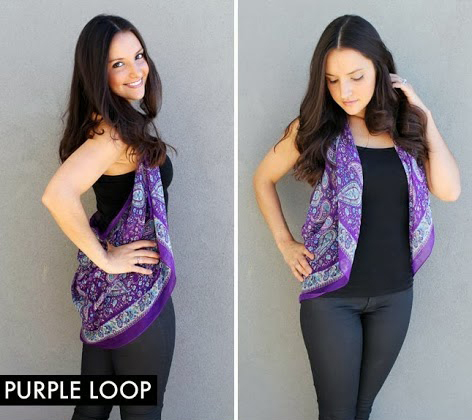 Scarves can even be turned into vests, believe it or not! Just tie the ends in a certain way and then flip the tied section behind your neck. It will add a pop of style to any outfit. 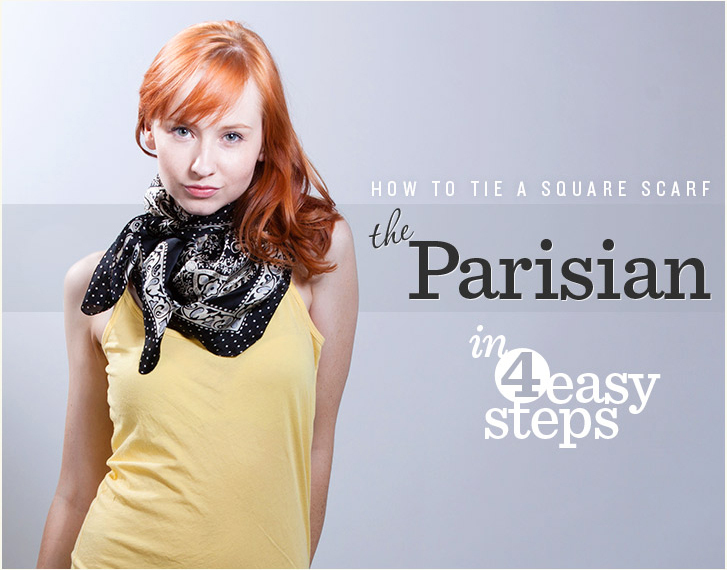 Make your way over to My Favorite Things to find out how to tie a scarf this way yourself. And last but not least, the pièce de résistance – the fancy braided scarf! This one appears to be braided, but it’s actually twisted in a way that mimics a braid. 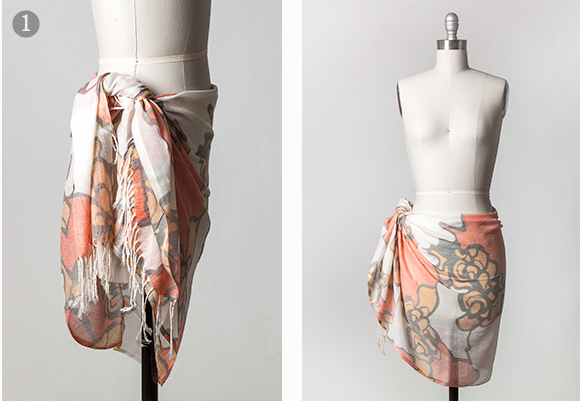 Make your way over to Scarves.net to check out the helpful how-to video so you can recreate this one yourself.